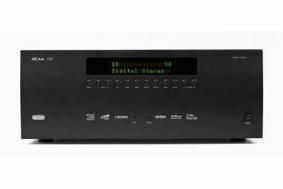 BRISTOL SHOW 2011: See and hear Arcam's new FMJ AVR400 receiver | What Hi-Fi? Slotting in beneath Arcam's pricier AVR600 and AVR500 models (£3500 and £2500 respectively), the AVR400 costs a more affordable £1700 and will be available shortly in silver or black. It's a 7.1-channel, 3D-compatible device with 7x90W of power, HDMI 1.4 connectivity with Audio Return Channel, decoding of all the latest high-definition audio codecs, and a DAB/FM/AM tuner. It will also stream audio from your home network or stored on USB, and is fitted with a Torino video processor capable of supporting 1080p/60 and 24fps (frames per second). For custom installation, the AVR400 has RS232, IR and 12V control interfaces.